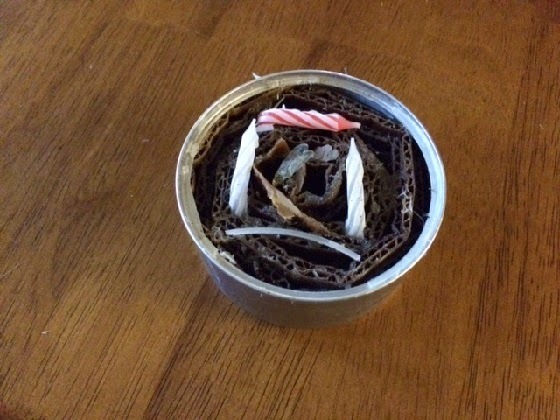 Remember "buddy burners" - cook stove fuel cans made by packing cardboard and birthday candles into a tuna can, and dousing the interior with melted paraffin? Well, I make 'em out of cat food cans, and I noticed something: The top of an opened cat food can is a perfect mate for an inverted kitchen sink stopper to fit right in. So I tried an experiment. Had a buddy burner left over from last year, and a cheap spare stopper in the garage, so I put the burner in the fireplace. Gave it a light, let it burn for a few minutes. Next, I carefully dropped the stopper (with the center rubber stopper part removed) on top the burner. All good to this point. 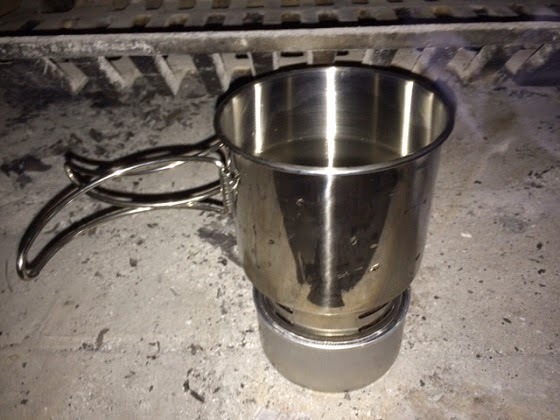 I then placed a metal camp cup with 12 ounces on water on top the stove. Flame levels instantly dropped, but didn't extinguish. Slow, slow, slow. Yes, the water boiled, but it took about an hour. The stove returned to a robust flame as soon as I removed the cup. The flame was easily extinguished by placing an upside down empty cat food can over the stove. Minor modifications would probably improve performance. Lower fuel contents in the burner might help, but I suspect cutting or drilling more ventilation into the sides of the stopper would help even more. 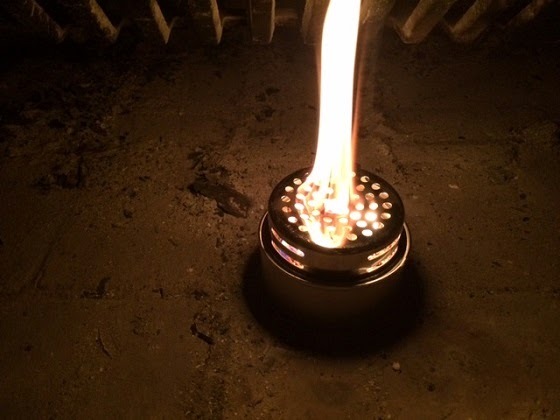 I'm also thinking a drilled cat food can, with wider openings cut on one or two sides, might make a good twig firebox with the same stopper again used as a top for a wood burning micro-stove. Would certainly save the time and effort that went into making buddy burners.